Oh no, not another ancient children’s book, written in pre-historic times! I hesitate to add this, because the website is getting overloaded with classic children’s books, which was not my intention. But the book leaped off the shelf when I was in the library, and the title sounded so familiar, that I had to take it home and read it. However, I read it before I even got home, just sitting in my car. This children’s book is definitely ‘retro.’ It even includes learning to read with “See Spot Run.” The sentences are short and choppy. But, I love the premise of the book. I love the idea that these four children make themselves quite at home in a boxcar. I love that there is a happy ending. And…as a remedial reading teacher, I actually love the accessibility of the text. Because it has short sentences, it makes a great early reader. Is it great literature? I don’t think the language and writing fit my criteria. But I like the book, and I would enjoy seeing how kids respond to it. To me, the excitement of the adventure of being out in the world on one’s own makes up for the lack of beautiful language. So…there you go. 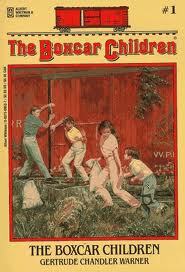 I’m adding The Boxcar Children to the library. Would love to know what others think. It is part of a fairly long series of other Boxcar books, but I can’t say much about the rest of them, and I’m unlikely to read the others.